You just have to love Red Gate tools. They find the small area that they want to cover and then they cover it extremely well. I rave regularly about SQL Prompt and SQL Compare and SQL Search (free one, btw). I’ve got SQL Data Compare and SQL Data Generator open & working on my desk regularly. I’m dabbling in their other tools fairly often as well. I just like Red Gate tools. I guess my constant & consistent praise is why I’m a “Friend of Red Gate.” I like to mention that before I start praising their tools some more, just so no one thinks I’m hiding it. Why would I hide it? I’m proud to say it. I am a Friend of Red Gate! … anyway… where was I… right, new software. I took a small part (a very small part) in the beta for their new software, SQL Source Control. I thought it was pretty cool when it wasn’t quite working right. Well, now it’s out, working very well, and it’s pretty slick. 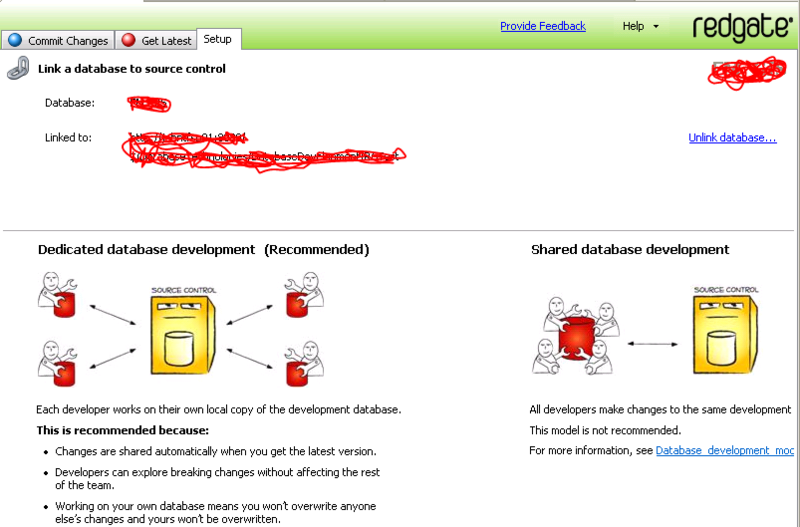 Basically Red Gate has created a nice tight coupling between Source Control & your database. They currently support Apache Subversion and Microsoft’s Team Foundation Server (TFS). It let’s you create a mechanism for keeping track of your databases in the same way that you track your code. I honestly believe this is a must for any reasonably sized development team (read, more than two). I can expound on why, but instead I’ll just talk some more about SQL Source Control. I’ve scratched out my own server & database names, but you get the idea. The description summarizes it very well. Lots of people can work on the database, save the scripts into source control, and then they can pull that common set of scripts back out to do more work, just like working with code. It really is the best way to develop. If you can see that, that’s a database (name hidden) that’s been hooked up to source control. Actually, that and the change to the set-up screen are about your only indications that this tool is running. I love the lack of intrusion. Better still, each time you reconnect the database, as it goes and checks to see if there are updates in source control, you get a little spinning… looks like a yin/yang symbol. Enough about pretty graphics. How does it work? Extremely well. I started adding new database objects, editing existing objects, and all it ever did was put one of it’s little symbols on the object that I had created or edited, marking it as a change. When I was ready to move the changes to source control, I just clicked on the Commit Changes tab. All the changes are listed and you see scripts showing before & after between the code in the database and the code in source control. It just works. Same thing going the other way. A database already connected can just pull changes out and apply them. Nothing I did in all my testing hit a snag (granted, I was just working on pretty traditional tables, procedures, indexes, etc.). The one thing I’ve found that I don’t like is that there doesn’t seem to be a facility for deploying the databases automatically. Instead, I had to create a blank database, hook that to the existing database in TFS and then pull down all the “missing” objects. Hopefully they’ll go to work on a way to automate that soon. Just to reiterate, the point of the exercise is to get your code (and while you’re developing, a database is as much code as anything written in C#) into source control. Once you’re in source control, you manage your databases just like code, label, version, branch, whatever you need to do to maintain a tight coupling with the rest of the code for the app. SQL Source Control acts as a very fast and simple tool to enable that coupling for you. I’m not kidding. Drastic measures are called for.